Another month has passed and at home our visiting garden wildlife has brought uplifting rays of sunshine in an otherwise bitterly cold and often dreary January. Pheasants visit each winter, occasionally we see Red Legged Partridges too. A staggering 35 million are factory farmed in abhorrent conditions and later released for shooting. The League of Cruel Sports video (highlighted in green) of conditions is really grim watching and the accompanying text alarming. 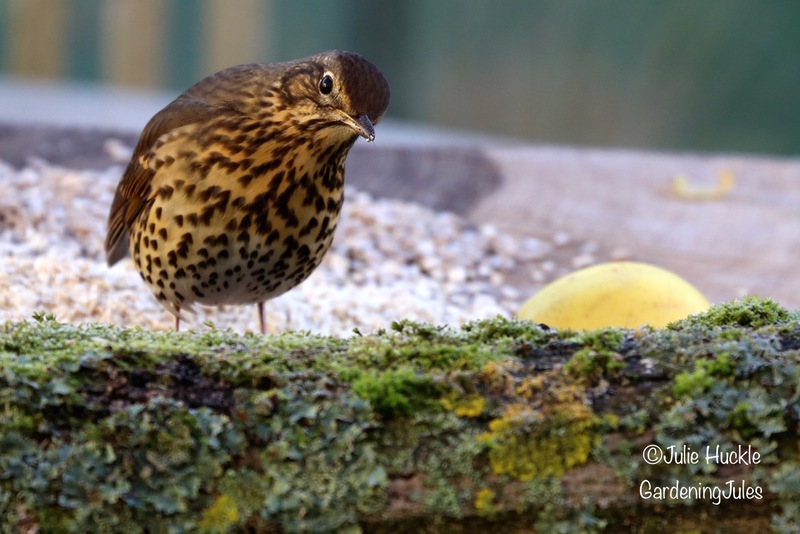 In better news, our visiting Song Thrush is now a regular on the bird table, they are a red status bird, in serious decline. 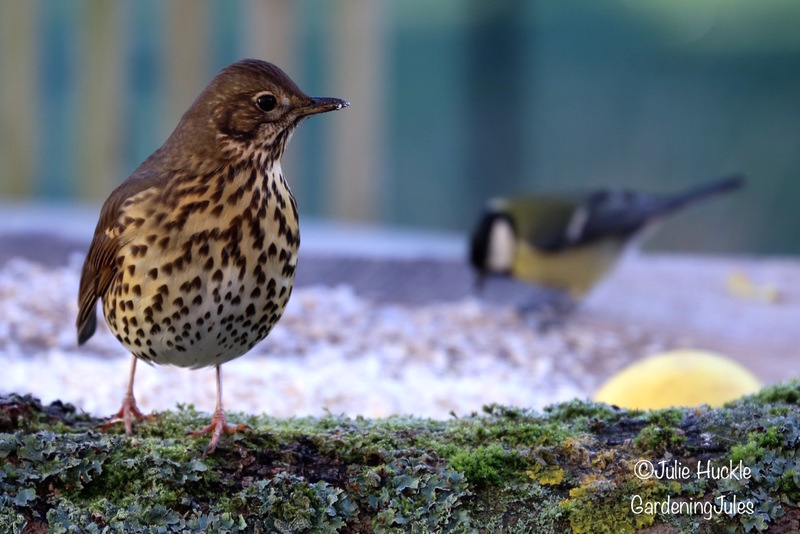 He or she just scrapped in, on my allotted hour of the annual RSPB Big Garden Birdwatch, which made me wonder if results get skewed with only a one hour slot. Either way, I am glad he is here. I’ve heard singing in late afternoon, so hoping he attracts a female and that our hedge will be the place she chooses to nest build. We live amidst intensively farmed arable land, blamed for the decline. 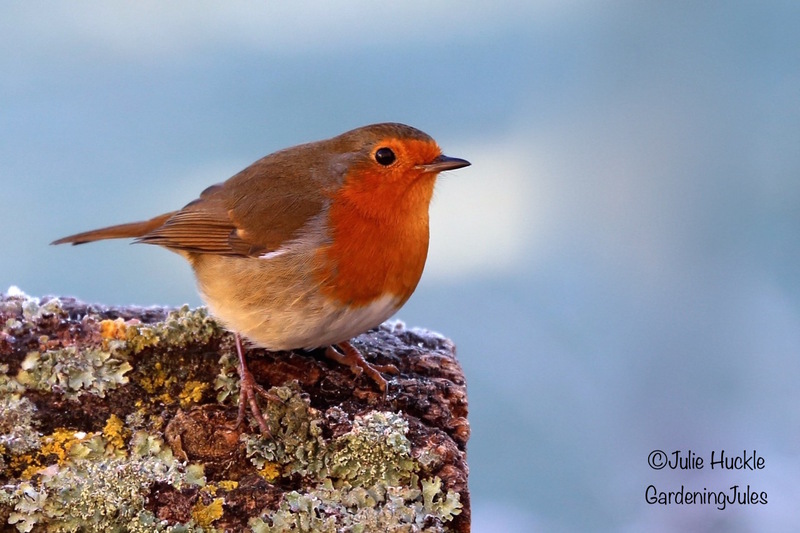 They prefer snails, worms and berries but during the harsher frozen weather has been visiting to eat Sunflower Hearts. 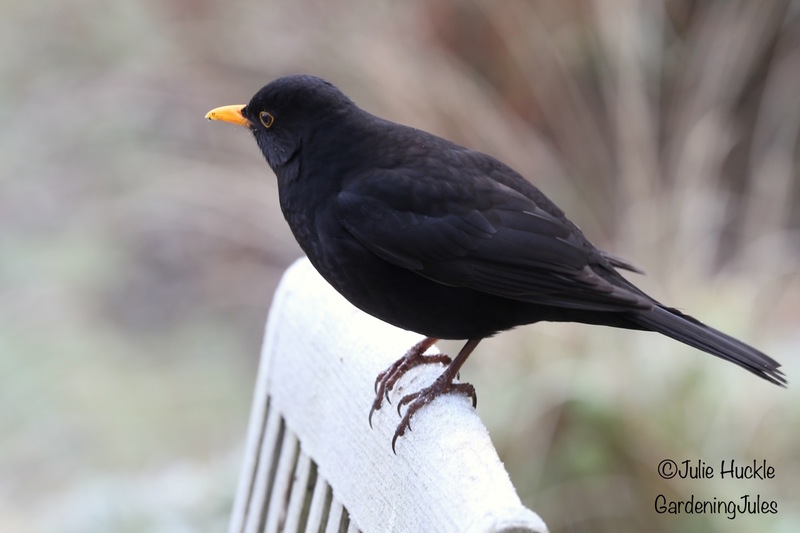 Territorial scraps have begun, several Blackbirds have visited trying to establish a territory. Young males with mucky coloured beaks are chasing each other, in turn, intolerant larger females chase them off too. But this wiley older male Blackbird with his distinctive bright yellow beak and a white star on his breast seems to be the current winner. I started some tentative tidying, inadvertently disturbing an overwintering toad, recovered him and retreated. And apart from a young vixen and grey squirrel its still the birds who provide movement and colour. 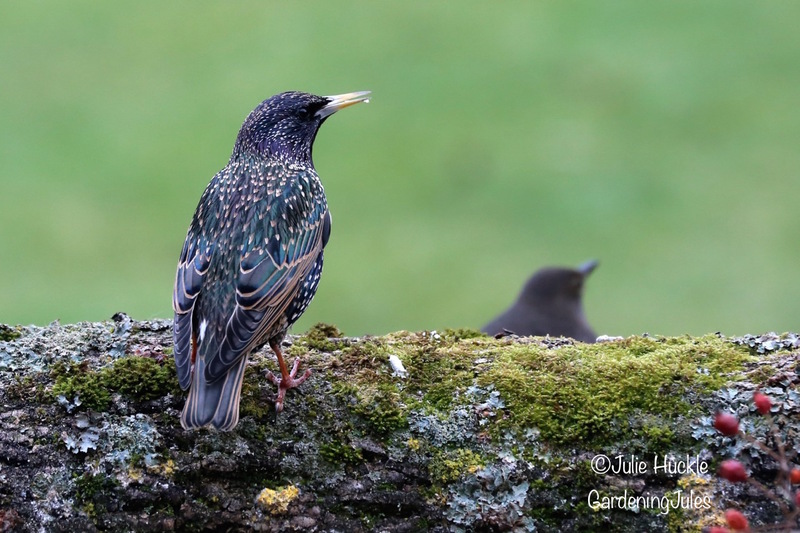 Starlings are quite beautiful and each Spring we are fortunate to host nesting Starlings in the eves of our roof. Days are longer, Spring might just be around the corner. 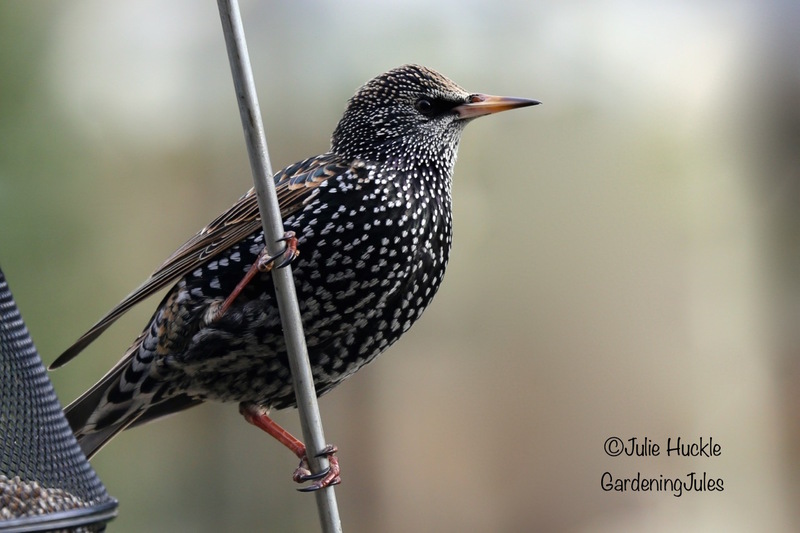 Starling on the look out. 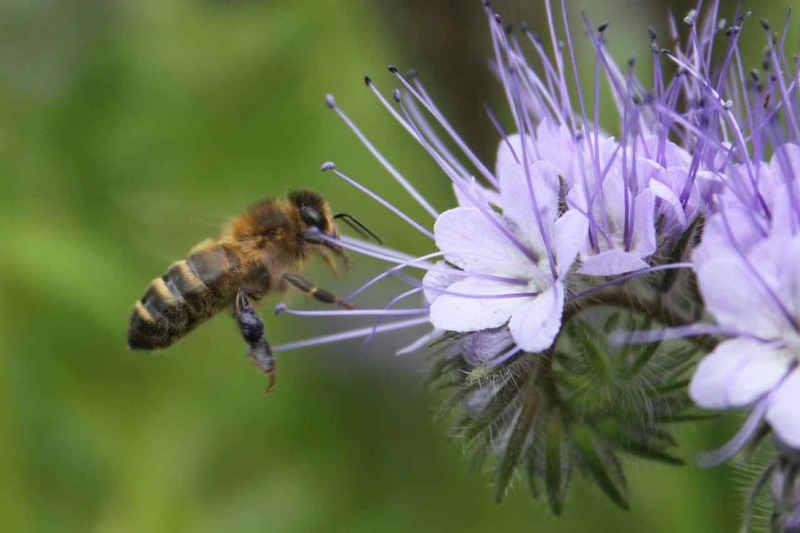 But for many creatures, this world is not kind and Spring is not around the corner. 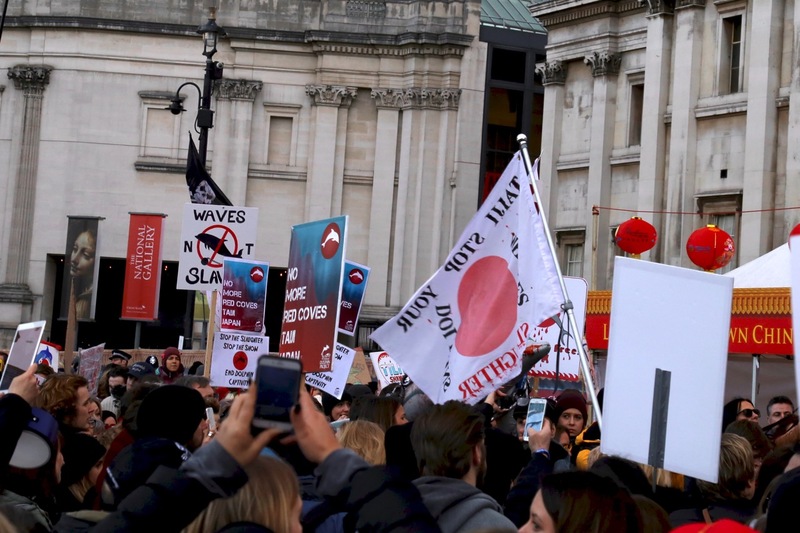 I joined the protest in London last weekend, campaigning for an end to the Dolphin trade in Japan. The trade captures Dolphins for sale as food or to be sold to Aquariums, “Swim with Dolphin shows” and zoos across the world. The National Geographic report a dolphin sold for meat sells for a few hundred dollars, a live dolphin with basic training can be sold for U.S. $40-50,000 abroad and $20-30,000 in Japan. 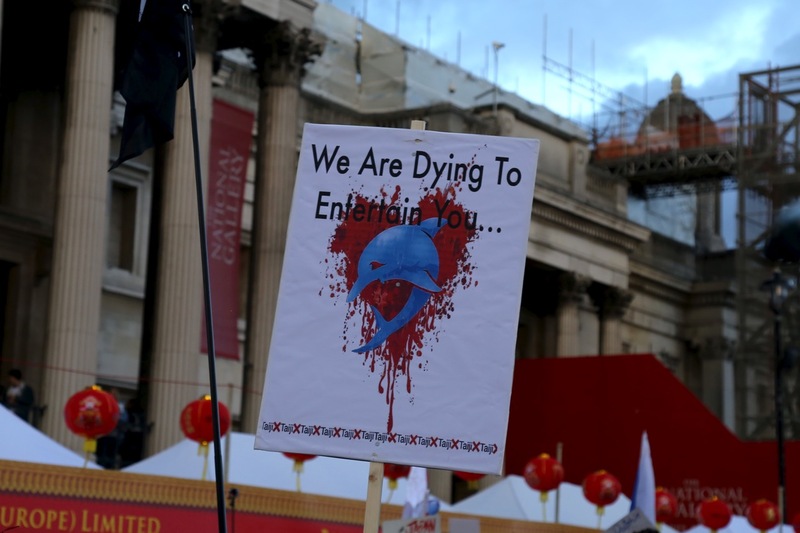 The Cove, a film which brought this to the worlds attention reports the sale price for performing dolphins is $150,000. 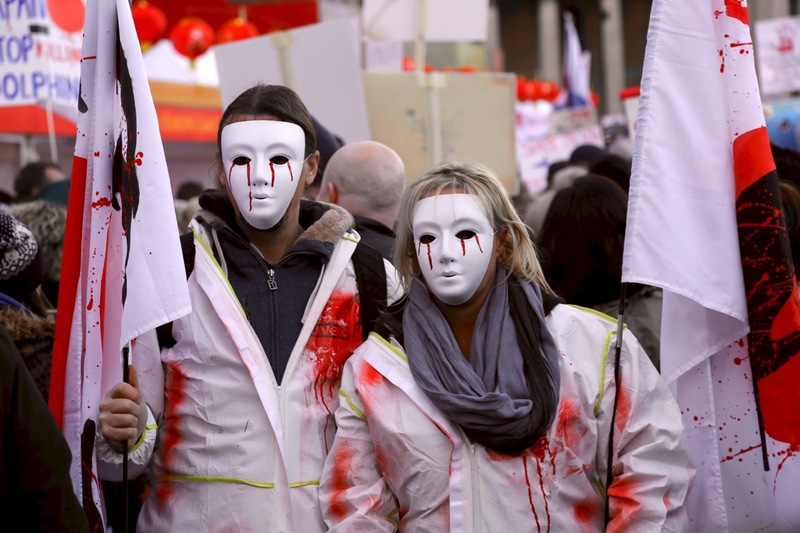 The protest centred around the Taiji cove hunts. 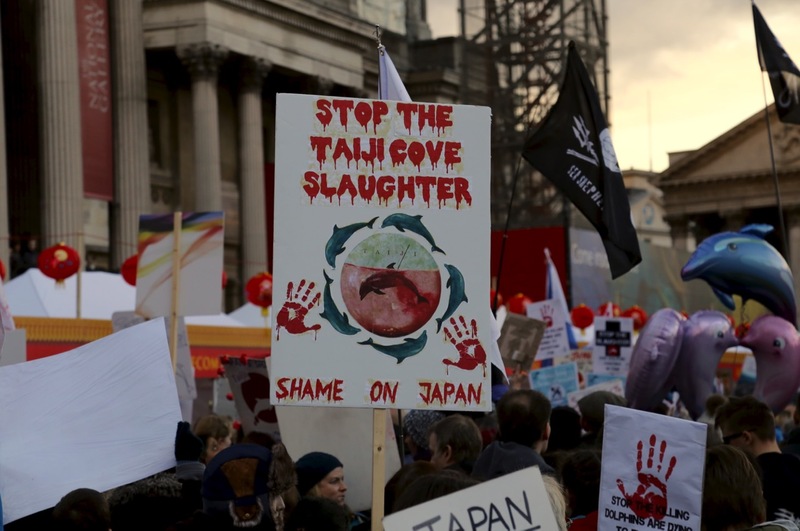 The season lasts from September to February, pods are herded by speedboats into a cove in Taiji, and then either killed by ramming a rod through the spine, which its claimed is humane or captured alive, the young torn from the family groups, for shipping on. The video link above on the International Marine Mammal Project website shows hunters surrounding and wrestling to capture a baby dolphin, whilst its mother tries to save her offspring. Its absolutely heartbreaking. The baby is destined for an aquarium, swim with dolphin show or zoo. Is it ok, to protest against other countries activities? I think so, the protest was peaceful. We can all take action in some way and speak out, sign the petition, or just be more aware. In 1995, we won a holiday with Robertsons Jam for a two week trip to Florida and free entry into Orlando Sea World. Our children were 3 and 18 months. We watched Tilikum perform. And saw Dolphins crowded and captive in a tiny pool. I look back on that now with absolute revulsion and shame, the children were not remotely interested. What on earth were we doing there. If you haven’t watched Blackfish already, I would highly recommend it. Thanks as always to Tina and her lovely blog My Gardener Says, for hosting this meme.